Made from recycled cereal boxes, these whimsical earrings celebrate the joy of life and nature and are made with an eye to both. Each earring is made to differ slightly from its mate while maintaining a unified theme. Every time you wear them, spotting the differences will be a source of amusement for those around you. 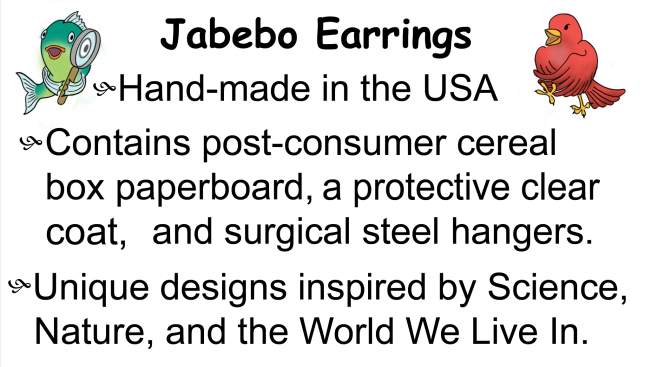 Cereal boxes are generally not recycled, but these earrings offer a way to do so and make something beautiful. Two layers of cereal cardboard are fused together as a base for the intricately detailed images, which are then covered with several layers of a water resistant finish. The end result is an earring that is super light-weight yet durable and able to take some exposure to water. On the back of each, you can still see the colorful patterns of the cereal boxes.